J.Kevi Group in conjunc- tion with Augusta Golf Cars is thrilled to announce, Denarau Golf and Racquet Club as the recent recipients of a beautiful fleet of E-Z-GO golf carts in Fiji. 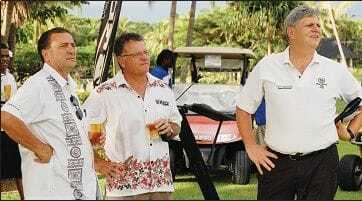 And the company Chief Executive Officer Raymond Georgiou said they have a long term view for Fiji. We are not going anywhere, we are going to be around for a long time to come and I hope that over the many years we will come to contact with those people running resorts and golf courses and use the type of products we sell,” he said. Augusta Golf Cars Pty Ltd is the Exclusive Master Distributor of all E-Z-GO, CUSHMAN and BAD-BOY products for Australia and the Pacific Islands with the J. Kevi Group in Fiji being the local agents. Denarau Golf and Racquet Club took delivery of the new vehicles recently being one of the only resorts in the Pacific region to have a fleet of E-Z- GO ‘Inferno Red’ RXV’s. Augusta Golf Cars sent a fleet of 65 vehicles to the Islands premier resort to be used on the 18-hole Interna tional golf course. Mr Georgiou said the electric E-Z-GO RXV’s include features such as: a 48 volt AC motor, an ergonomically designed console with integrated cup, ball and tee hold- ers, as well as permanent tow bars. “Our opposition in Fiji has had their own way for too long and it’s about time we give them a good go. With the joint force of well estab- lished J. Kevi Group and the resources we are investing in Fiji, we hope we will over- time become a premier brand and a dominant force in Fiji,” Mr Georgiou said confidently. “The E-Z-GO/CUSHMAN is made up of at least 30 different products we have the vehicle to satisfy differ- ent needs or even better we can custom-build a product to suit your individual needs. We basically move from being a fleet golf cart to a niche specialty golf cart operators so we invite everyone of you that have requirement to contact the J. Kevi Group and we hope that we can suit your requirement,” says Mr Georgiou. The relationship between E-Z-GO Carts and the Starwood Group, par ticularly the Denarau Golf and Racquet Club has been a healthy one for the past ten years or even more says Sheraton Fiji general manager Shane Cunning. Speaking as the chief guest at the launching of the E-Z-GO Carts at the Denarau Golf and Racquet Club recently, Mr Cunning recalled the strong relationship the Starwood Group has had with the distributors of the renowned golf carts – Augusta Golf Cars PTY Limited. “I know in Australia, the Augusta Golf Cars company and E-Z-GO Carts are the ones everyone wants to work with and I see Raymond (CEO of Augusta Golf Cars) here almost four times in a year with his after sales calls and he certainly walks the talk when it comes to the golf carts and telling us how to go about the servicing and also training of our people on how to handle the carts,” Mr Cunning added. 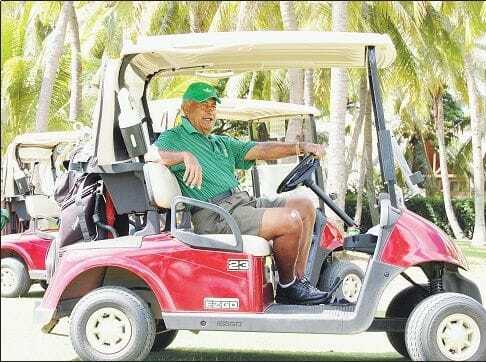 He said J. Kevi and Augusta Golf Cars have formed a strategic alliance with the Starwood Group and the Denarau Golf and Racquet Club and they wish to continue the good relationship for many years to come. They say work is for people who don’t play golf but one of Nadi’s leading businessman Narendra Reddy likes to mix work and golf together to ultimately give customers the best service and products on the course. Reddy who owns J. Kevi Group has been a pioneer in distributing quality golf carts to golf courses and resorts all over Fiji for the past twenty- one-years now. “E-Z-GO is the best product of its type and is made in USA and we are proud to the exclusive local distributors of Augusta Golf Cars PTY Limited,” Mr Reddy said. According to Mr Reddy, his company is now distributing other lines of golf carts from Augusta Golf Cars such as Cushman and Bad Boy. “Each model has its own uniqueness and is built to satisfy the individual needs of the customers,” Mr Reddy adds. 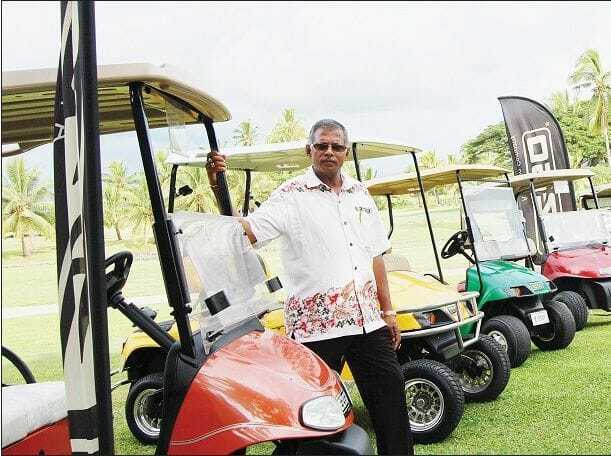 While addressing guests at the official launch of the new generation E-Z-GO carts in Fiji, Mr Reddy said his company provides the greatest products and services for golf carts and utility carts around golf courses, resorts and island properties. Mr Reddy also acknowledged the support of Mr Shane Cunning, the general manager of Sheraton Fiji and various valued customers around the island.